My friend Jen loves apples, and knows I love recipes. 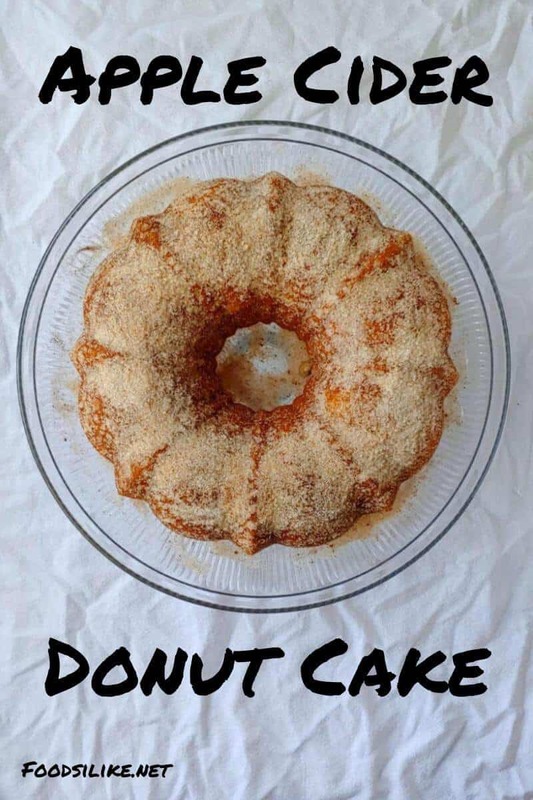 One day during Fall 2012, she sent me a recipe for an Apple Cider Donut Cake. I looked for a reason to make it all autumn, but lacked either the ingredients or the time. I finally had the apples, the cider, and a reason to make it and share it when I took it to a December party celebrating the end of National Novel Writing Month. It’s been 6 years at this point since I made this cake, but I tried it another time recently and thought it was worth sharing with you again. I’ve been focused on making baked apple cider donuts this year, but haven’t really worked out a recipe yet. This cake recipe, however, is exactly what I’ve been looking for – the subtlety of apple cider donuts, made in the oven, coated liberally with cinnamon sugar. Apple cider is unfiltered, unpasteurized apple juice; it usually is pressed using unpeeled apples. It’s less sweet and a little tangier or sharper than apple juice. I feel like I’ve seen apple juice in the juice aisle labeled “cider,” and I’ve seen unfiltered apple juice there as well; it won’t compare. I’m talking about the gallon or half-gallon jugs that you get in a refrigerated section in your produce aisle. I don’t particularly like apple juice – it’s too sweet – but I love apple cider once it’s autumn. If you haven’t tried it, you should! 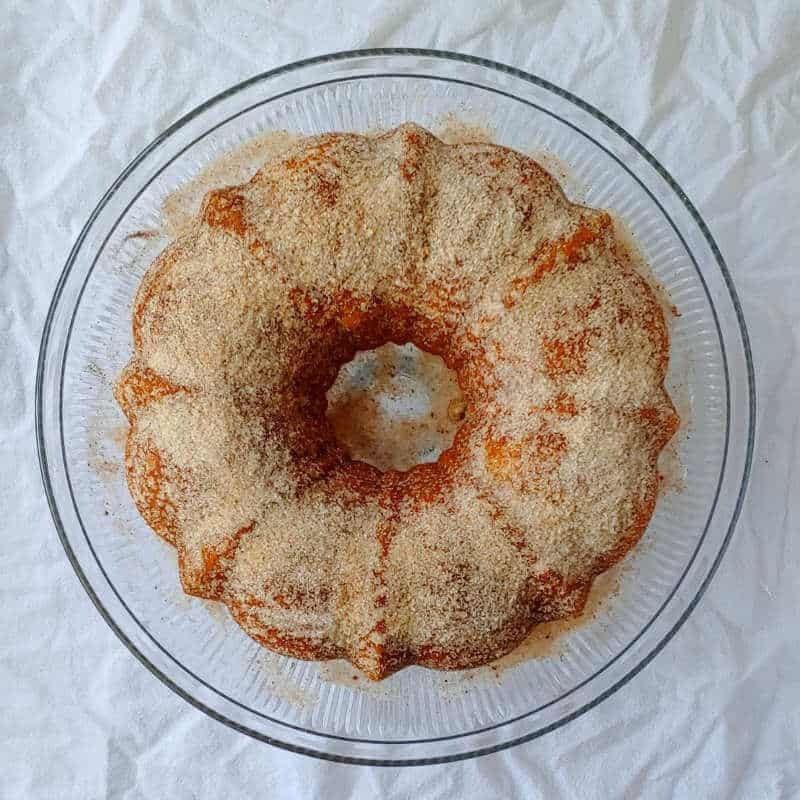 In addition to making this cake, you can warm it with spices; add grated cinnamon and nutmeg, then a minute or more in the microwave for a quick mulled apple cider on a cold night. You can mix it into a cocktail, if that’s your kind of thing. Want to cook with the apple cider instead? You can make my No-Sugar-Added Slow Cooker Apple Butter. Smitten Kitchen also has an apple cider caramels recipe that I’ve always wanted to try, but haven’t. 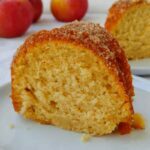 This Apple Cider Donut Cake recipe originally comes from Serious Eats, but I hope I’ve made a few clarifications. You can read the details below, or just jump to the recipe here. Every apple cider donut recipe I’ve come across has boiled and reduced apple cider to concentrate its flavor. This cake does that as well, but the process isn’t nearly so long. You start by cooking some apple cider with some finely chopped apple. Use a flavorful apple. It doesn’t matter if it’s a baking apple or cooking apple – you’ll blend it with the apple cider in the end. You’ll have some extra cider mixture in the end, and that will be delicious for mixing into oatmeal or a smoothie, or drinking on its own (perhaps with a little bourbon mixed in). In any case, this process, from starting cutting the apple to blending it with the apple cider after cooking, took me 35 mostly hands-off minutes. Next, you put together the cake batter. It’s a simple batter spiced only with nutmeg (the spice in many donuts that I could taste but couldn’t quite identify for the longest time). You cream together butter with white and brown sugars for a few minutes, add eggs, vanilla, and oil, and beat for a little longer. Then you alternate adding in flour and leavenings with your apple cider and milk. Part of the key to this cake is the extensive mixing. This gives you a very light, fluffy batter than makes a light, tender cake. You scrape this batter into a VERY well greased Bundt or tube pan, then bake at 350F for 35-50 minutes. There’s a large range of baking time on this cake because your apple cider mixture may be more or less liquidy. Also, I feel like not all Bundt pans bake the same. Mine are old, old-school heavy aluminum pans (my green one was my great-grandmother’s). In any case, my cake baked for the minimum time. Cool your cake for 10 minutes, then cross your fingers and turn the cake out of the pan. If you’ve greased the pan well (I used a mix of rubbing the inside of the pan with the butter wrapper and spraying it liberally with cooking spray), it will slide right out. Carefully pry any other pieces from your pan and place them on the cake. The best part of this cake may be the cinnamon sugar that you pat on top of it. It sticks a little better to the sides if you spray the cake lightly with oil, but it’s not strictly necessary. Just know that most of your cinnamon sugar will be on top, and not so much on the sides. 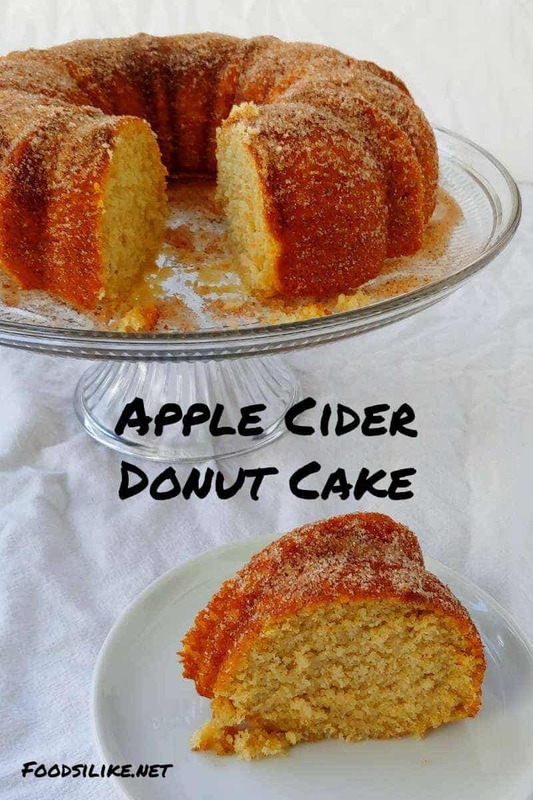 How Does the Finished Apple Cider Donut Cake Taste? This is an amazing cake. It’s incredibly fluffy and tender from the milk and butter and lots of mixing, just like an apple donut. The apple flavor is light and subtle, and the nutmeg flavor was distinct but mild. Cinnamon sugar was delicious on the outside of the cake. The cake is sweet but not incredibly so; I ate leftovers for breakfast with coffee this morning – again, just like I would apple donuts. Alex thought this was better than apple donuts because the cake was very light, whereas apple donuts can sometimes be very dense. I cannot think of anything bad to say about this cake. I recommend using the most delicious apples you can find, preferably on the tart side, to enhance the apple flavor. As I mentioned, leftovers are delicious. If kept covered, the cake is still moist and tender at least 3 days later – probably longer. Be aware, however, that the cinnamon sugar will dissolve somewhat, and won’t be as pretty. Sprinkle with a little extra cinnamon sugar before serving if this will bother you. 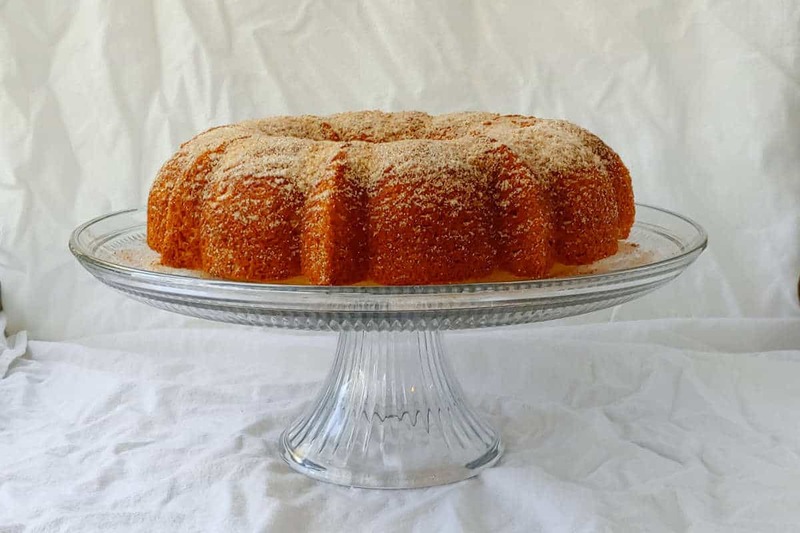 This is perhaps one of the most tender, fluffiest Bundt Cakes I have ever made. I recommend it to you on that basis alone. Only downside with this? It takes a little extra time to make, since you have to cook the cider and the apples together before you make the actual cake. This adds an extra 35 minutes to the cake-making process. I’m confident you could do this at your leisure, refrigerate the cider, and make the cake another day. 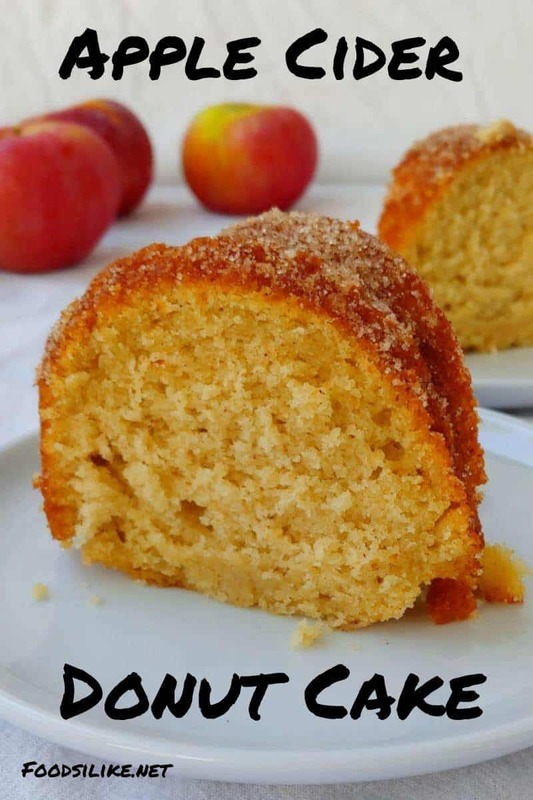 Want other apple recipes? Try No-Sugar-Added Slow Cooker Apple Butter, Apple Pie Bars, Caramel Apple Pie, Fresh Apple Cinnamon Scones, or Apple Galette. 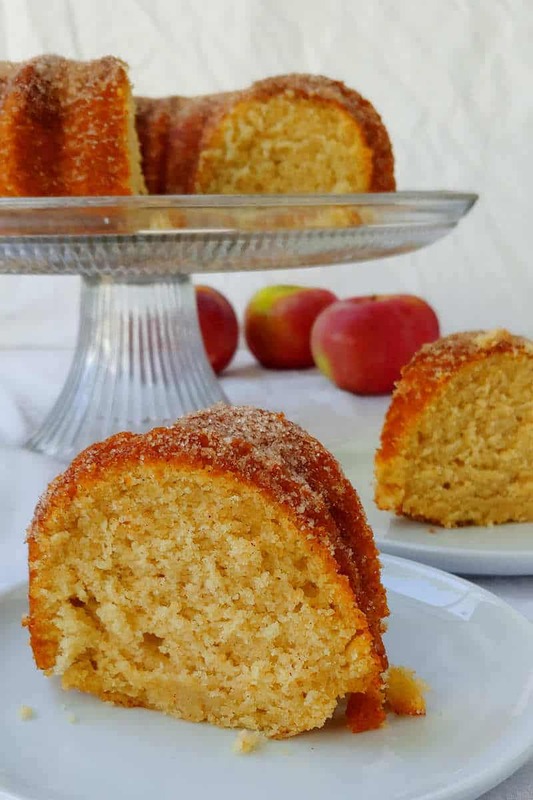 A tender and delicious cake that has the subtle taste of an apple cider donut, complete with cinnamon sugar on top! Combine flour, baking powder and soda, salt, and nutmeg in a mixing bowl. Set aside. Cream butter with sugar and brown sugar in stand mixer on medium speed using the paddle attachment for 3 minutes, until light and fluffy. Add eggs, one by one. Add oil and vanilla, and mix for another minute, until well incorporated. Alternate adding the flour and apple mixtures in batches, beginning and ending with the flour mixture. Scrape the bottom of the mixer bowl to make sure butter and sugar isn’t stuck there (like it was in mine). Mix for 10 more seconds to make sure everything is airy and light. 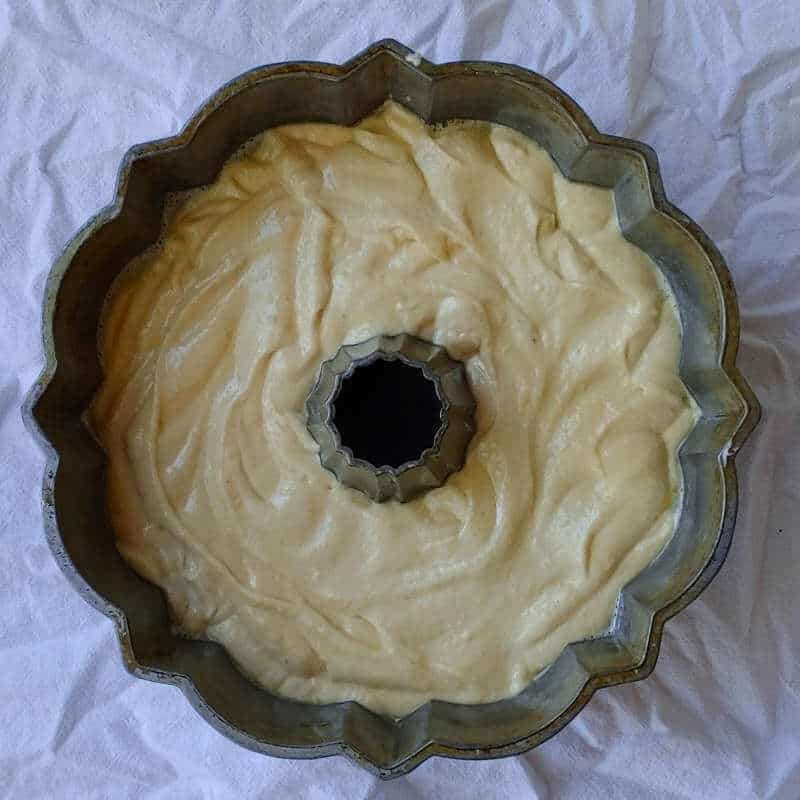 Pour batter into an extremely well greased Bundt cake pan and bake at 350F for 35-50 minutes. Mine took 35 minutes exactly in my oven, even though my apple mixture was very thin, but some people have said the cake takes longer. Cool cake in the pan for 10 minutes, then invert onto cake platter. I had a piece stick to my cake pan the first time I made it, so be sure you’ve greased it really well. Combine sugar, cinnamon, nutmeg, and salt. Coat cake with cinnamon sugar. I sprayed my cake gently with oil, section by section, to help the cinnamon sugar stick. This is optional; cinnamon sugar will stick well on top without oil. Cool completely (or at least 45 minutes, as I did) before cutting. 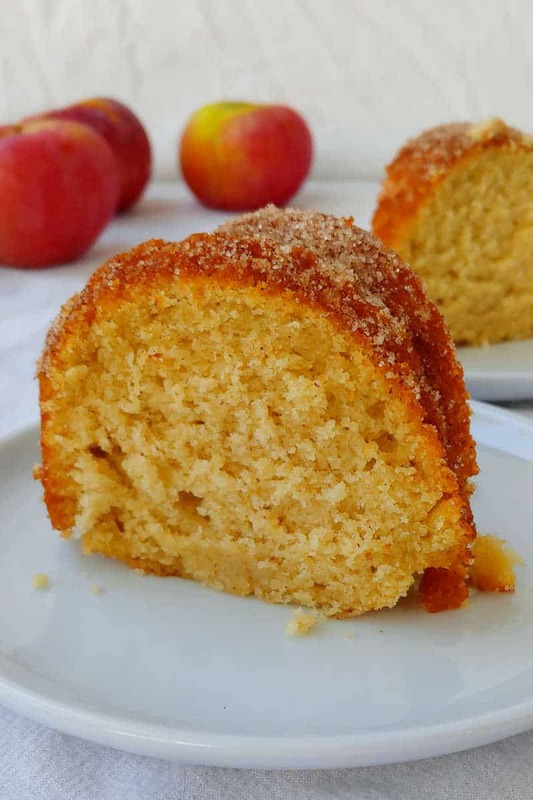 The apple flavor in this cake is mild, although certainly there. You can try reducing the cider more for additional flavor. Choose the most flavorful apples you can find. I peeled mine for this, as I didn't want the texture of the peel in this cake, but you can try leaving the peels on if desired. Use freshly grated nutmeg if at all possible. Its flavor is much better than preground nutmeg. Mixing the batter for this long beats a lot of air into the batter and makes the cake incredibly fluffy. The high butter and oil content in this cake makes it very tender. Ohh yum. This looks so fluffy and delicious. I made this last night and it was a hit! Super soft and fluffy and delicious! Mike said it is his favorite dessert ever (second only to cheesecake). It’s on our Thanksgiving menu now too!